Al-Shabab Says It Carried Out Deadly Car Bomb Attack On Somalia Hotel : The Two-Way The attack happened during a particularly sensitive political process that al-Shabab is trying to disrupt. Somalia has recently sworn in a new Parliament and is planning presidential elections. 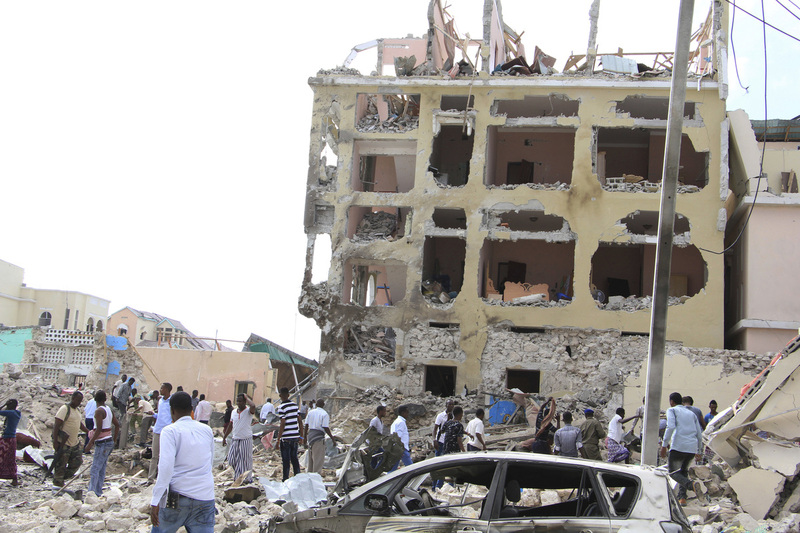 A crowd gathers near the Dayah Hotel after it was heavily damaged by bomb blasts on Wednesday in Mogadishu, Somalia. Al-Shabab militants have claimed responsibility for deadly explosions that ripped through a hotel in Somalia's capital, Mogadishu, on Wednesday. News reports on the death toll varied, with numbers ranging from at least eight to 28. More than a dozen people were wounded. Video by The Associated Press captured frenzied scenes of people fleeing as one of two bombs exploded at the Dayah Hotel. It later shows a street strewn with rubble and debris. It's unclear exactly how the attack unfolded. Multiple news reports say the militants set off a car bomb at the gate of the hotel, then stormed the building on foot. A second bomb exploded shortly after the first. However, as NPR's Eyder Peralta reports from Nairobi, "Radio Andalus, which is associated with al-Shabab, says the attack started inside a hotel and then 'martyrs' moved outside with a second explosion." Security forces were able to break through the militants' siege at the hotel, according to The Associated Press. When the gunmen entered the hotel, the news service reports, "survivors described chaotic scenes in which hotel residents hid under beds and others jumped out of windows of the four-story building to escape the attackers." Abdirizak Omar Mohamed, a senior government official, told the BBC that four militants were killed by security forces. African Union forces pushed al-Shabab out of Mogadishu more than five years ago, but the al-Qaida-linked group continues to mount attacks there, as The Two-Way has reported. Hotels are a frequent target. The Dayah Hotel is said to be popular with politicians. It advertises online that it opened in 2013 and is "conveniently located ... near the Somali Parliament building." The attack happened during a particularly sensitive political process that al-Shabab is trying to disrupt, Eyder added. Somalia has recently sworn in a new Parliament and is planning presidential elections. At least 12 people were killed in an al-Shabab attack last June in Mogadishu's Hotel Nasa Hablod, as The Two-Way reported.